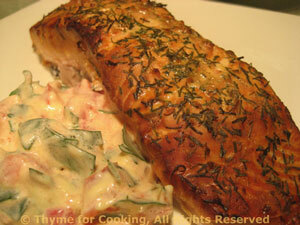 Grilled Salmon with Tomato Tarragon Sauce, Thyme for Cooking easy fish dinner. We lightly smoked the salmon, directions are below... If you prefer, it can simply be grilled or roasted in the oven. The salt is scraped off before serving. Rub salmon lightly with olive oil. Sprinkle with dill weed, then salt. Grilling without smoking: Put salmon in a grill basket if using barbecue grill or use a mesh grill pan or grill mat. Cook over indirect heat for 10 - 15 minutes depending on thickness. You might need to cover the grill for 5 minutes or so. Oven: Put on baking sheet and roast in 400F (200C) oven for 15 - 20 minutes, depending on thickness. Smoking: Soak a small handful of wood chips in water for at least 15 minutes. Gas grill: Only light one side of the grill. Wrap the soaked wood chips loosely in foil. Poke a few holes in the foil and place on the grill. Keep the fish off of direct heat and the grill cover closed and vented or propped open an inch or so. Cook for 12 - 18 minutes. Chop tomato. Snip herbs: hold leaves in one hand and snip with a scissors. Put into a small bowl and add mayonnaise. Mix well. To serve: Gently scrape off the excess salt using a table knife or fork. Serve with Tomato Tarragon Sauce on the side. Note: Salmon should flake easily but not be dry; remove from heat when just barely done.